Here are the top five things that happened over the weekend in high school track and field and, wait ...cross country! Marcellus Moore has been a traveling man in 2019, and he's been everywhere but his home state of Illinois grabbing big-time performances. In January, he set the set the national 60m standard with a US No. 1 performance at Texas A & M, then reset it in Arkansas the very next week. Well, three weeks later he's reset it again, only this time it came in ....Iceland. As part of a unique opportunity afforded by the National Scholastic Athletic Foundation, Moore headed to Reykjavik, Iceland, along with seven others from the United States -- primarily athletes from the Northeast -- and competed in an indoor competition against a host of other athletes from different countries. And Moore brought out the fire-emoji for the final, where he boomed out of the blocks for a new nation-leading time of 6.71 seconds. While no boy has yet to cross the 6.7 second threshold, it seems as though Moore is steadily gaining traction toward that mark (6.76--6.75--6.71) and may be this season's best bet to win a national title at New Balance Nationals Indoor. 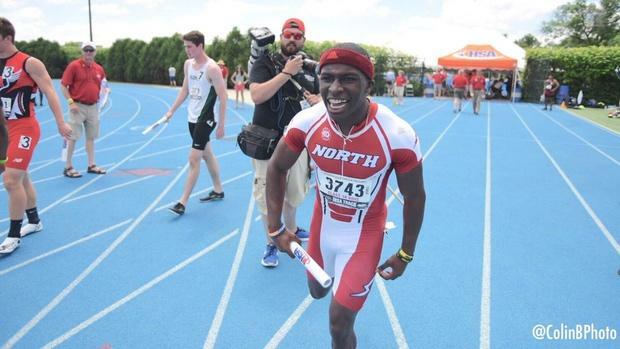 Next up for the Illinois athlete is a strong meet in Kentucky, and then NBNI. More Noteworthy Iceland Performances: Bullis' Ashton Allen won the 400m in 47.70 ...Hannah Waller and Leah Phillips scored times of 7.64 and 7.65 in the 60m, respectively . Distance runners had to make a decision this year with World Juniors on the calendar in Denmark. Extend the season out, and take a pass during the indoor season -- and some of the spring -- to prepare and eventually land a qualifying bid to the IAAF U20 Cross Country Championships. The reward was certainly worth it. And three high schoolers are basking in that decision just a few days after, including the likes of Grace Ping, Heidi Nielson and Carter Cheeseman. All three fought tough odds at the USA Junior XC Championships on Saturday in Tallahassee, Florida, considering collegiate athletes under the U20 cut-off still were eligible to qualify. But all three finished within the top six places of their respective races to get in -- Grace Ping (21:26.9), Heidi Nielson (21:30.1), Carter Cheeseman (24:46.2). For Cheeseman, it was another big moment. In a men's 8K race that featured a handful of former Foot Locker Nationals and Nike Cross Nationals qualifiers, he had to test his endurance, hold on for large swaths of time, and then trust that he had enough left in the tank to make a push for the finish in enough time to qualify. And the Fort Worth Christian senior, a two-time All-American at Foot Locker and Notre Dame signee, continued to show why you should never count him out of anything, finishing sixth overall. Ping's performance, however, was the most dominant, which is impressive when you consider she had a disappointing outing at Foot Locker in 31st. But that race aside, Ping brushed it aside and hinged her hopes on a bid to Denmark. It was never in doubt, as the Minnesota sophomore held on the hip of Nicole Clermont and never really let go, finishing fourth overall in the women's 6K race. Nielson, who was fourth at states in Texas but a top 30 finisher at both Foot Locker and Nike, made sure she never found herself in seventh and booked her ticket, too. Ping, by the way, isn't done just yet. She's headed to Trinidad & Tobago on Feb. 16 for the North American Central American and Caribbean Athletic Association Cross Country Championships. The blue-chip New Jersey prep athlete travelled to North Carolina for the Camel City Elite Invitational on Saturday with a chance to throw down an all-time performance at the JDL Fast Track. The Trenton Central runner went 2:03.98 in the 800m, fourth all-time in the books and nearly three seconds faster than her best from indoors in 2018, and left with an idea of her potential this year. There is no doubt she's on a path to break the indoor national record of 2:01.78 eventually -- maybe even this year -- though the better question will be whether the junior has a potential to go under 2-minutes over the outdoor season and take a run at Mary Cain's 1:59.51 from 2013. Mu doesn't train under high mileage, and her coach, Al Jennings, has taken a longer approach to make sure his athlete is healthy for seasons that extend far beyond traditional schedules. But even Jennings might not have guessed the kind of year Mu is having. She's US No. 1 in the 400m (52.55), 600m (1:28.54), 800m (2:03.98) and 1K (2:44.43). The Valor Christian athletes were each entering the indoor invitational at different points in their seasons. For Sprout, it was his first race, and a good one at at that -- 4:23 in the mile. Hall, meanwhile, was coming in with a fair amount of competition already -- it was her sixth meet of the indoor season -- and that fine-tuning showed. Hall scored an overall career best in the 60mH, producing a US No. 9 of 8.56 and followed with another clearance of 5-10 in the high jump, which was her second converted attempt at that height in 2019. Do you know how many indoor state titles Amaris Tyynismaa has won in four years with Montgomery Catholic? The answer is ridiculous: 13. And yet, she isn't done just yet. The University of Alabama signee has 10 more titles to her name over the outdoor season, too. Her performance over the weekend was the fifth time she had tripled at the state championships, either indoors or outdoors, and continued a thread of dominance in her home state of Alabama. While Tyynismaa didn't set any PRs, she ran respectable times in the 800m (2:20.05), 1600m (5:04.02) and 3200m (11:05.02).